If you had told anime fans that RWBY, a show created by Rooster Teeth utilizing 3D animation, would one day be a household name among the community, many would have laughed in your face. And yet, so many years later, that’s exactly what the show has become, and it doesn’t look to be slowing down anytime soon. Boasting break-neck fight pacing and an engrossing story, it continues to bring in fans and wow those who have stuck around for the ride, opening the doors for other animated shows like it the world over. As such, there are more than a few shows to watch if you enjoy it, and these seven, in particular, are some of the best anime to watch if you’re looking for something similar. A standout title from the Fall 2017 season, Land of the Lustrous is exactly what people always dreamed 3D anime could look like. 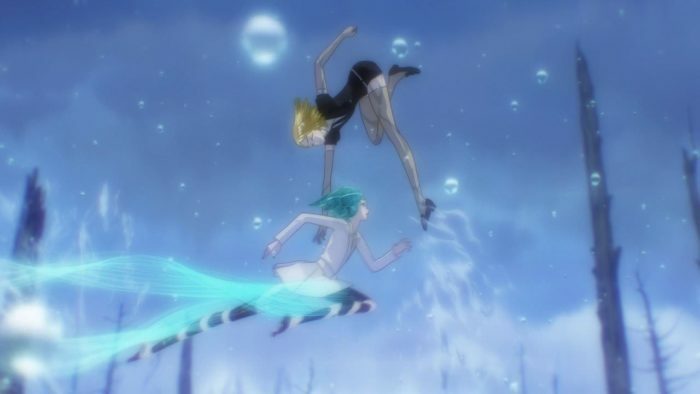 Following Phos, a sentient jewel person tasked with creating an encyclopedia of information about the world around them, the story can be reflective one moment and action-packed the next, all the while moving as fluidly as the best shows anime has to offer. Strange as the premise may be, it’s one that is executed brilliantly and gives real hope to the dream of top-notch 3D anime being just on the horizon.